con la supervisione tecnica di Daniele Vannozzi del Registro italiano (IIT-CNR, Istituto di Informatica e Telematica del Consiglio Nazionale delle Ricerche di Pisa) delegato per la gestione dei domini facenti capo al country-code Top Level Domain(ccTLD) ".it" e la collaborazione di Laura Abba, Giorgio Giunchi, Stefano Trumpy, Claudio Allocchio, Enzo Fogliani, Raimondo Bruschi ed Alessandro Pilotti. Leone Randazzo has produced yet another thoughtful work on the history and impact of the Internet. The Domain Name System, invented in the early 1980s byPaul Mockapetris with help from Jonathan Postel and others, has become a very important part of the Internet infrastructure. It figures strongly in the World Wide Web as a key part of the hyperlinks that serve as signposts in cyberspace and it has become an economic engine in its own right. It is also the source of great controversy, as I have discovered in my nearly seven years of service on the Board of the Internet Corporation for Assigned Names and Numbers (ICANN). As with his other works, Randazzo seeks to bring clarity to the fog of history and I am grateful to him for that effort." 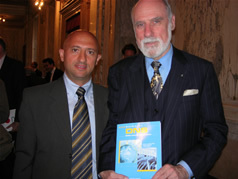 - Leone e Vint Cerf il giorno della consegna della Laurea Honoris Causa a Vint Cerf e Bob Kahn a Pisa il 26/5/2006. - Da sinistra a destra: Vinton G. Cerf, Robert E. Kahn, Bill Clinton (ex. Presidente U.S.A., artefice tra il 1997 e il 1998 - insieme al Vice Presidente Al Gore - della stipula del Memorandum of Understanding che sancisce la "apertura" della gestione del DNS e di Internet al mondo intero).